It may be gray and cold in Boston today, but we are having a sunshine day in the office! Read on to find out why! This week is a huge week for us here at JNA; we get to launch the amazingly talented Christine De Carvalho!!! When I first saw Christine’s work, I fell in love with her dramatic feminine style mixed with an unmistakably, cool California flare. I can practically feel the sunshine on my face in those popping pinks and cool minty leaves that seem to sway in the breeze! As we came to know Christine better, we also got to know the breadth of her work. Her range of experience is quite impressive! From a haute couture fashion designer in Paris to in-house Textile Designer for John Galliano, she has worked all over the world using her fabulous skills. We feel so lucky to represent this powerhouse of a designer! While Christine’s themes are quite varied, she manages to keep her signature style in tact whether painting loose watercolor flowers or working digitally on unicorns. 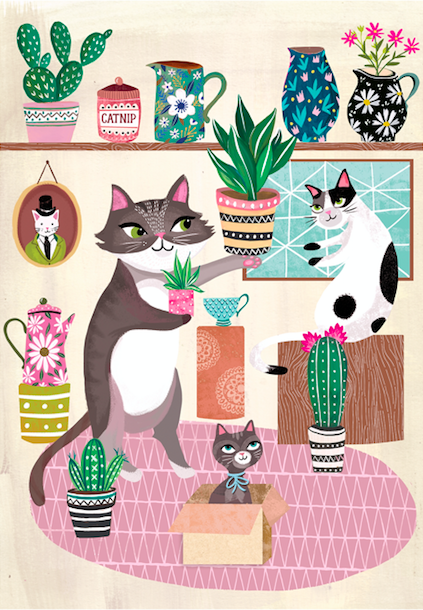 Much of Christine’s work is inspired by her love of folk art, fairytales, and vintage children's books. Animals and nature are some of her favorite subjects to illustrate. We are so pleased to say that Christine’s work is now available for licensing and buy-outs. Or, If you want to see what she can come up just for you, she is also available for commissions. Check out her fantastic work below and visit her bio for more information!